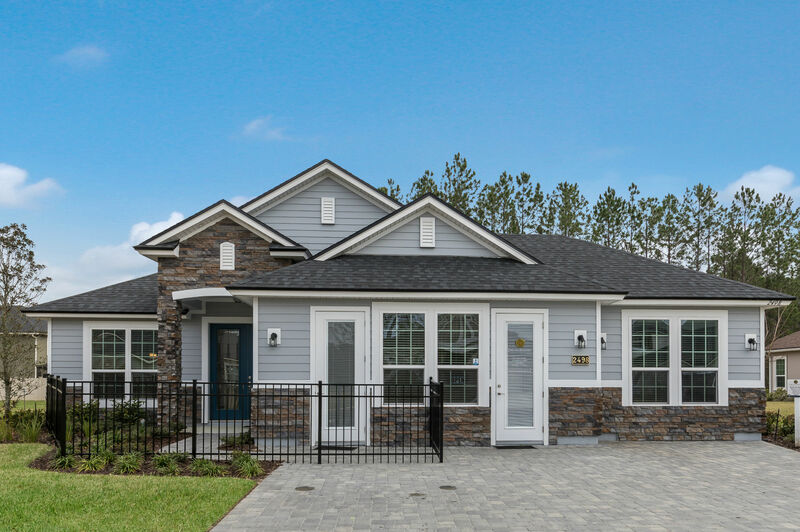 A beautiful eight foot glass, double door entry greets you as you enter the Edison II's open floor plan with a separate formal dining room. The kitchen overlooks the family room with a beautiful fireplace and large sliding glass doors that open out to the over sized lanai. An extra large bay window opens up the Master Suite, allowing for the perfect sitting area to relax in at the end of the day. It's the luxurious master bathroom with an over sized shower and free standing tub though that really make this home a dream come true! Directions from I-10: Take Chaffee Road (SR 23) to Oakleaf Plantation Parkway. Turn right and go 2.6 miles to Eagle Landing’s entrance (Eagle Landing Pkwy). Go straight on Eagle Landing Pkwy to first left at Eagle Crossing Dr. Take 2nd Left at Autumn Pines Dr., then right onto Club Lake Drive. Model is on the left.